Sri Lankan Ambassador to China Karunasena Kodituwakku on Wednesday strongly pushed back recent media reports criticising Chinese investments in his country, saying that Sri Lanka was not forced to accept investments and loans from China and wants to continue cooperation with China under the Belt and Road (B&R) initiative. Chinese investments in Sri Lanka have come under increased criticism, mostly from Western media and officials, who have accused China of using a debt trap to gain control of strategic commercial routes, after a Chinese company’s acquisition of stakes in a strategic port. 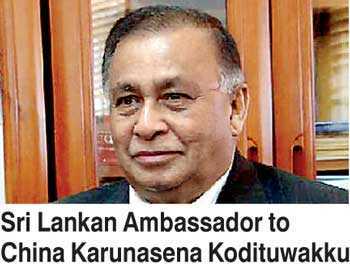 But the Sri Lankan Ambassador painted a vastly different picture. Due to unsatisfactory performance at the port, China Merchants Port Holdings and the Sri Lanka Ports Authority last year inked a deal to transfer a 70% stake in two Joint Ventures (JVs) that would manage the port. Under the agreement, which is valid for 99 years, the Sri Lanka Ports Authority will, starting after 10 years, gradually purchase stakes in the JVs to reach a 50-50 equal stake, according to the Xinhua News Agency. Hyping the news, some Western media organisations and officials have accused China of exerting an influence in countries along the B&R initiative through what they describe as debt traps. In the interview, Kodituwakku also stressed that Sri Lanka is seeking more Chinese involvement in economic development in his country, from industrial bases to export capacity building. While Sri Lanka wants to further strengthen its diplomatic and economic ties with China, the country is also open to cooperation with other countries such as neighbouring India and the US, which has increasingly shifted its strategic focus to the Indo-Pacific region, the envoy said.